INTRODUCTION I originally became interested in blacksmithing through my twin interests of jewellery and antique weapons. Back in 1999, I decided to take an introductory blacksmithing course at Sydney Institute in order to learn how to make my own jewellery tools, figuring I would save a lot of money and learn a few things at the same time. Since then, the jewellers art has fallen by the wayside and blacksmithing has taken over. As of March 2005 I have completed the required blacksmithing units of the Manufacturing Technology (7792) course in Blacksmithing, namely NF300 (Anvil Forging I), NF301 (Power Hammer Forging I), NF302 (Power Hammer Forging II), NF303 (Power Hammer Forging III), NF304 (Stamping Dies), NF305 (Forging Levers and Bosses), NF306 (Forging Lifting Gear), NF308 (Fabrication and Forging), NF309 (Alloy Steel Forging), NF310 (Spring Making and Repair), NF311 (Forging Discs and Solid Rings), NF313 (Shaft Forging), NF314 (Basic Heat Treatment), as well as the supplemental units Anvil Forging II, Anvil Forging III, Non Ferrous Forging, Tool Making and Repair, and Architectural Forging. However there still remain some non-blacksmithing units to complete before I graduate. 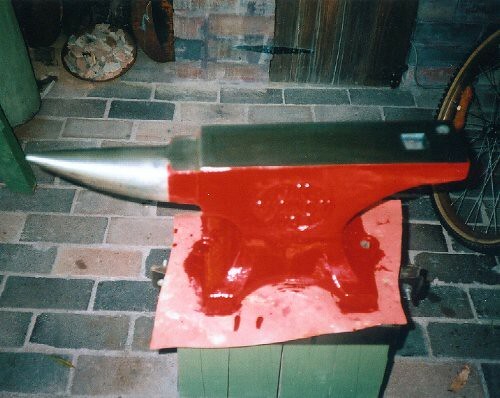 The main item of tooling in any blacksmiths shop is the anvil. My first anvil was made from a piece of railway track, and weighs 25 kg (about 50 lb). This is fine if you are doing jewellery or other fine work, but hopelessly inadequate for anything else. I realised this almost straight away, and started doing research on different types of anvils. At the time (1999) the only Australian manufacturer had just shut down, and the only imported model available was the excellent, but expensive Peddinghaus. My thoughts then turned to finding an anvil substitute until I could afford the real thing. It was then I started wondering how the "London pattern" anvils we used at college evolved, and whether such a complicated shape was really necessary. I started researching historical anvils to that end. The following are a series of early blacksmithing images I have compiled. With some of the older images, you must take account of artistic interpretation. Painting and drawing are not as realistic as photography, and in the era before perspective was invented, images can be highly stylised. One of the reasons I became interested in metal smithing was because of the treasures of the past, often made with the simplest equipment. Here we see a selection of Celtic blacksmiths equipment from Nikolausberg, Austria, dating from about the 3rd-4th centuries BC. One can hardly imagine the amount of wealth represented by the blacksmiths anvil, given the high value placed on iron at the time it was probably made. It is an unfortunate fact that many important iron artefacts from the past, unless lost, hidden or buried, must have been recycled into other objects. 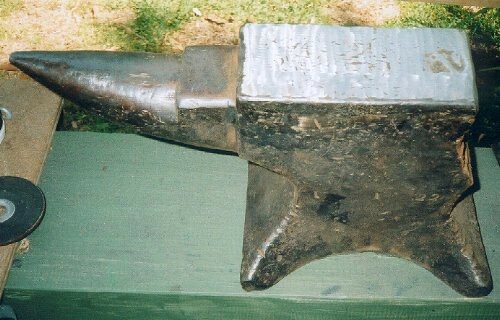 Small block anvils like this were used from Celtic and Roman times right through to the modern era (in developing countries). One Roman anvil was excavated at Pompeii. Two Roman anvils have also been excavated in England. The first, from Sutton Walls, weighs 50.5 kg (111 lb). The second, from Stanton Low weighs 23.2 kg (51 lb). Both contain holes for heading nails or rivets, and it is probable that they were both welded together from a number of pieces of metal weighing about 7 kg. A wrought iron beam which weighed 250 kg (550 lb) was excavated at Catterick, England, so we know the Romans must have possessed even larger anvils. Both of these anvils share a similar shape to the Celtic anvil shown at left, with a tapered base presumably intended for mounting into hole in a tree stump. The carbon content of the Sutton Walls anvil is 0.5%, and the face was hardened to 190 HV (Vickers hardness scale). Similar examples were found at Mainz and Kreimbach in Germany. Both were very similar to the Sutton Walls anvil, but the Mainz anvil had a flat, rather than a tapered base. An more unusual anvil was found at Cow Park, Hartfield. It consists of an iron plate 600 x 230 x 40 mm resting on two tree trunks. It dates to 50-135 AD and was found at a bloomery furnace site. Presumably it was used for initial forging of the large iron blooms. Bicks, or Beak-irons were also used, but seem to have been rare. An example weighing 20 lb was excavated at Silchester, England. Another was found at Heidenburg, Germany. Vulcan forging a helmet, from the Aeneid of Heinrich von Waldech. We see the block anvil still in use more than 500 years after the fall of the Roman Empire. Note the cross pein hammer. The German minstrel Hartman von Starkenberg forging a helmet, and about to knock off for lunch by the looks of the chicken and wine the lovely maiden is bringing him. Notice he is using both an anvil and a special shaping block on his anvil stump -although this could also be an artistic representation of a small bick or beak-iron. Armourers at work in a medieval forge. Contrary to popular belief, armour was shaped while cold, and only went into the forge for annealing in between sessions of hammering. The only exceptions are deeply sunk sections, such as the fingertips on gauntlets. Notice the unusual four horned anvil, curved hammers, and bick in the background. A number of specialist armourers anvils, with broad convex faces still survive today. While illustrations of armourers at work are numerous, it should be remembered their equipment and methods of work were not the same as ordinary blacksmiths. Stylised image of a medieval smith from William Caxtons "Game and Play of Chess", 1483. Note the pentagonal faced anvil and the curved hammer head. "Der Schimdt" by Jost Amman. Two smiths from the 1500's hard at work. Note the substantial anvil block, the traditional enclosed forge, and the small but important details such as the linked tongs, and small upsetting block next to the single-horned anvil. It appears to be a traditional polygonal faced anvil with a supplementary round section horn welded on. This represents an important transitional form. A realistic impression of a smith at work from sometime in the 1500's, from a Flemish woodcut. The pentagonal anvil is still present, as are some bellows, a long quenching trough, a leg vice and rather bizarre lion faced dog under the bellows table. Illustration from the important work "De Re Metallicus" by Agricola. The figure in the foreground is using a great little trip-hammer to forge out flat bar. The control lever is close at hand, should he wish to start or stop the hammer. Anyone into self sufficiency and who has a source of running water nearby could build one of these indispensable tools with very little effort. The two figures with hammers in the background are rough forging a bloom of iron which has just been removed from a smelter in order to solidify it and squeeze out any remaining slag. The masked man in the background is working a small-scale iron smelter. The glassy molten slag can be seen pouring out the side. This was collected, broken up and put back into the melt to act as a flux, as well as to extract any remaining particles of iron. From the same work, another view of the iron-master's works, showing the double bellows and trip hammer. The boy is quenching the hot steel as it is being hammered. In the days before scientific research, steel was thought to become harder by virtue of the properties of the water used for the quench, not the chemical content of the metal and rate of cooling. Cold hammering was also used to work harden the metal. Detail from "Venus at the forge of Vulcan" by Jan Brueghel, c 1620. Note the huge anvil, double bellows and cannon boring mill in the background as well as the raising stakes and hexagonal faced anvil in the foreground. The missing half of this picture shows a large trip hammer in operation. "The Forge of Vulcan" by Velasquez. The main anvil, called a "grasshopper anvil" is indigenous to Spain and southern France. Instead of the usual system of mounting by spikes passing through "feet", it has spiked feet which secure themselves as the anvil is used. The stump anvil next to it is unusually substantial, but very elegant. An illustration from Diderot's "L'Encyclopedie, ou Dictionaire Raisonne des Sciences, des Arts, et des Metiers" showing a large blacksmiths shop in the early 18th century. Note the long iron bars stored in the yard outside, the massive anvils, and the elaborate double forge set-up. From Diderot, scene in a smithy set up for manufacture of horse shoes. 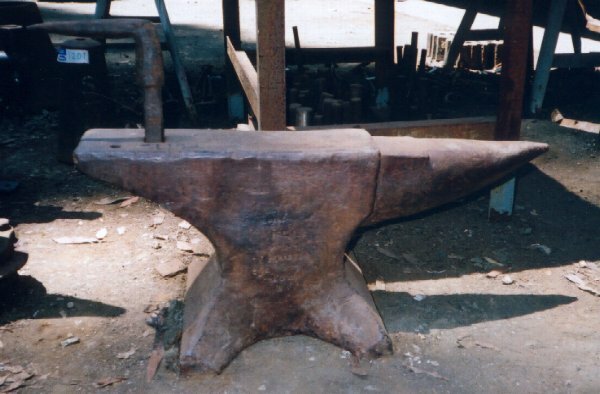 Note the rounded horn on the anvil, a feature which was still missing from many anvils in this era. Workshop for manufacture of stirrups, again from Diderot. Note the two anvils, the handy looking double horned stump anvil on the left, and the massive double arched double horned anvil on the right. "Arched" anvils like this are still being made today in eastern Europe. "The Blacksmith" by W. Biscombe Gardener, 1883. There is a large, modern looking side draft hearth, with efficiently designed tong rack along the side, as well as a leg vice solidly attached to a stump. "Blacksmith" by Randolph Caldecott, 1876. Three smiths take a well earned rest. The massive anvil, and the substantial looking sledge held by the figure in the foreground give some idea of the important work these men are engaged in-perhaps making large agricultural equipment such as ploughs or harrows. Illustration by W. Small, 1883 of blacksmith wielding a sledge. Note the solid looking square topped anvil, an unusual survival for the time. By the late 19th century, mass produced wrought and cast anvils were flooding the market, almost all variants of the "London" pattern. 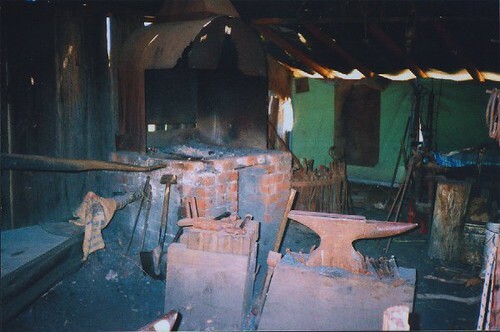 My own smithy, completed September 2002. The hearth measures 600 mm deep by 1000 mm wide and is blown by a electric blower through 8 tuyeres. The hearth is lined with fireclay and firebricks, and has a 125 mm deep trench running side to side. The forge can be adjusted for size simply by blocking off unneeded tuyere holes with fire bricks. The hood is 400 mm above the hearth bed, and the diameter of the flue is 275 mm. During the first test firing, it failed to draw properly when the blower was switched on. Triangular steel brackets were added to either side of the hood, which seemed to cure the problem. I still think the flue could be longer (its 2.4 metres, but I hate working at heights). On subsequent firings, the forge functioned as expected, but the tuyeres quickly became blocked with slag. To my surprise I was even able to do some forge welding, but having learned blacksmithing with gas forges I still have a long way to go. The small size of the smithy is a hindrance (3 x 3 metres), as is the amount of clutter that started to accumulate as soon as the roof went on. I have three anvils at the moment. The first is made from railway track and only used for the finest work. The second is a 160 lb BK Sydney on long term loan from a friend. The third is mystery anvil with the heel broken off. 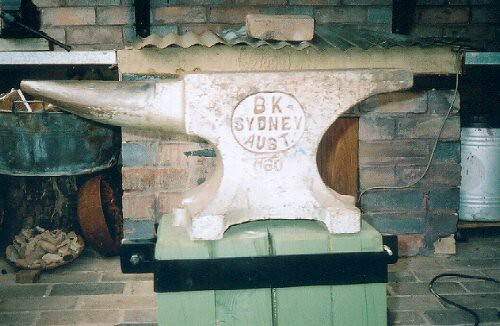 The BK Sydney anvil is a cast iron anvil with a steel face bonded to it. The condition was good, but the casting has been very poorly finished at the factory and there were signs of abuse on one edge of the face. This turned out to be the result of inconsistent heat treating leaving a soft spot on the face (or perhaps some idiot heating the area with an Oxy-Acetylene torch and drawing the temper). 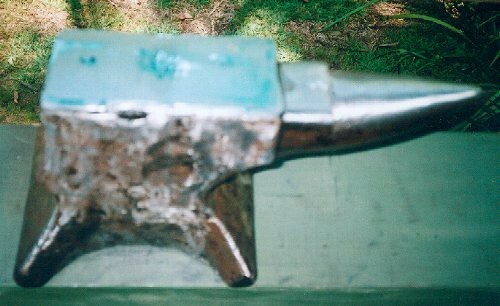 I decided to refinsh the anvil using hand held power tools using instructions found on Anvilfire.com - but I don't recommend it. It took me 16 hours of work and many many abrasive belts to get a good result. Additionally, I checked my work carefully with a surface plate and straight edges as I went along, to ensure both flatness and freedom from twist. The result of all my hard work was a mirror finish, but next time I will take it to a local machinist and get it surface ground. He charges $AUD50-100, versus the $AUD320 labour and $AUD50 in materials it cost me. The mystery anvil I have originally weighed 162 lb (it's is stamped 1-1-22), and is made from low carbon steel with a harder face. It was been forge welded from several large pieces of steel, my guess is the horn, heel, and feet were added to the body of the anvil. The heel is missing, as previously stated. Usually, the heel will break off at the hardie hole as a result of tools being wedged in the hole. In this case it broke along the weld, probably due to abuse by a sledgehammer. Someone obviously didn't remember the 20 to 1 rule (the maximum size hammer you should use is 1/20th the weight of the anvil - some would even say 1/30th - this is for efficiency as well as safety). The whole anvil was covered in chisel cuts (someone trialing new chisels), and in general the condition was very poor. Unfortunately, the guy who gave it to me had paid top dollar for this abused old boat-anchor. I spent 10 hours on this to get it useable. I didn't do any more work on it because it will need a new heel fitted and edge repairs at some stage and I haven't decided how to do it, or wether it's worth it yet. My opinion now after restoring two anvils? Buy a new anvil, or if you must buy second-hand buy it cheap and in good shape - don't waste time on old clunkers unless you are starting a museum, or someone is giving it away. BUYING AN ANVIL As stated above, I don't recommend buying a second-hand anvil unless it is in good condition and cheap. More on good condition a little later. As far as cheap goes, that really depends on what you are buying. Don't fall for the old formula of $X per pound. It's nonsense, because you are buying a whole unit, not a quantity. It's also a con used by people who want to jack up the price of an old door stopper. Rounding off from $1.75 a pound to $2 a pound makes the math easier, but it's going to cost you $140 more for a 5 cwt anvil. Think about it. Also at prices like those, you could get a new Czech anvil and still have plenty of change. Avoid auctions if you can. It's always worthwhile and often enjoyable going to a pre-sale inspection, but waiting around all day waiting for your lot to come up is a waste of time, and deliberately calculated to work buyers into a frenzy. Not to mention having to come back at a specific time to collect your purchase. If it's worth it, leave an absentee bid for a fair price. The type of auctions that offer blacksmithing equipment these days are usually full of collectors of one sort or another. Auctioneers will often play up to them, and paste photocopies from collectors books or old tool catalogues near equipment to "prove" its collectors value. You can't have it both ways, either you are buying a collectors piece, or you are buying a tool. You can't make an "investment" and then literally chip away at its value by using it. Or you could, but then you'd either be stupid or rich enough not to care. I have been to many auctions over the years and seen many disreputable shenanigans and even more stupid behaviour. At one sale, a 140 lb cast anvil was up for grabs. There was some interest, but it was mainly a machinist's auction so I was hopeful. I gave it a few taps and it rang in an odd way. Luckily the anvil was in strong sunlight and my colleague pointed out something I missed. Every time I hit the anvil a tiny puff of dust spurted out from between the steel face and the body of the anvil – the face was coming loose. Despite this I bid $AUD90 on it, but before long the bidding went crazy and the winner walked off with the anvil but $AUD450 poorer. At another sale, we turned up on a Sunday morning, only to find the auctioneer had changed the order of sale and excluded all the advertised (and desirable) lots in favours of a load of junk. After some angry words, he agreed to add a few smithing items as the climax of the sale. These included a mechanical hammer, two anvils, two swage blocks and some worn out blowers and tongs. Sure enough, the Peter Wright 280 lb anvil had some photocopies up next to it. Despite having had its entire face welded over with a stick welder (thin sheets of weld were flaking off) , and bad wear everywhere else it went for $1000 under the baleful influence of the auctioneers. 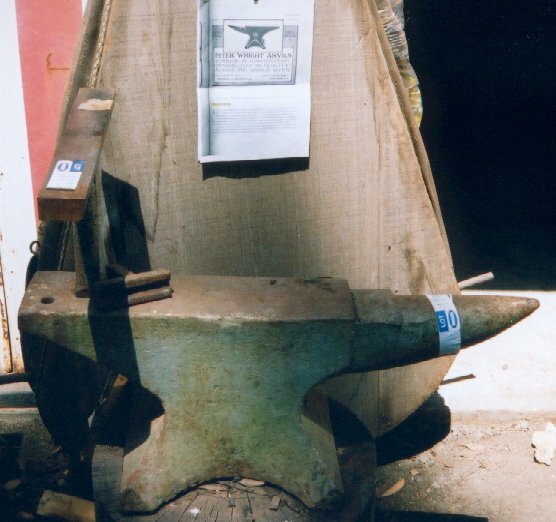 The second anvil, a 336 lb unmarked model in even worse condition went for $900. The Classified ads have their own pitfalls. A lot of anvils come up for sale here when local taxes fall due. Invariably, upon calling up the seller will ask for $AUD500 (or more recently, $AUD1000 – since taxes have gone up). The seller often knows nothing about the anvil (brand, dimensions, weight), but will invariably claims they would rather not sell the anvil because it was in the family for a long time etc. When asked where they have it stored, the answer is invariably "out in the yard". I'm sure if you checked, it would still have mud on in from when the tractor dragged it out of the bottom paddock! Come on now, how much effort does it take to store a "valuable heirloom" under an oily feed bag in the barn or shed? Now lets talk about condition. Don't buy an anvil that isn't in one piece. Worn out anvils often appear for sale with such obvious signs of abuse as broken or bent horns and broken heels (often at the hardy hole where tapered tools have been forced in, splitting the metal like wood), or in the case of cast iron anvils with a steel face, a loose or missing face. Check to see that the anvil rings by tapping lightly with a small hammer (ask the owners permission first). With a steel anvil, this should be loud and clear, especially out on the heel. Cast iron anvils with a properly bonded steel face will ring too, but with a different harsher tone. If there is a poor ring then the face may be separating. If there s no ring, and your hammer blow leaves a dent, you are not dealing with an anvil, but a Chinese 100% cast iron door stopper, otherwise known as an Anvil Shaped Object(ASO). Do not, under any circumstances buy a cast iron "anvil" without a steel face, whether modern or antique. The ball-bearing bounce test is a useful method of identifying different types of anvil construction. You need a ball bearing of 12.5 mm or larger diameter, and a piece of clear, rigid plastic tubing about 50 cm long marked into ten divisions. Position over the anvil and drop the ball down the middle of the tube. The amount of rebound is relative to the hardness of the anvil face, and a good anvil will easily give over 80% rebound. Do the test a few times over the whole face, and average out for a total score. On a well-hardened anvil, the centre will usually be a little harder than the edges of the face. Take a straight edge, small steel ruler and a small engineer's square along and check the face for wear. If an anvil is visibly worn out of true, you may be better avoiding it. Use the straight edge to measure how much you might have to grind/mill off the face to bring it back to true. Any more than 3.2 mm (1/8") may risk having to heat-treat the anvil again –not cheap – but a lot depends on the type of construction involved and the type of steel involved. Measure the hardy hole –avoid anvils with odd-sized holes. Most hardies are 25mm (1") or 32 mm (1 ¼"). Sure, you can make your own hardy tools, but it helps if you can buy tool steel off the rack that's a precise fit. Check for chipped edges, even around the hardy hole. You will end up doing a lot of fine work on the surface around the hardy hole. Check for repairs done with an arc welder. Unless the anvil was properly preheated, these may just break off first time they are hit. Also, the heat involved may have softened the face adjacent to the repair. On a solid steel anvil, the answer to that is to heat-treat the face from scratch. On cast iron and wrought anvils with steel faces, re-hardening risks cracking or loosening the face. All of this said, if you are being given a free anvil, take it. You may or may not be able to fix it. With patience, hard work, and money all things are possible (even turning a cast iron boat anchor into an adequate anvil). If you are offered a scrap metal anvil for private sale, point out its faults and offer scrap metal prices to the owners. Most will knock you back and try to find another sucker - some may be reasonable and just want the thing out of the way quickly. 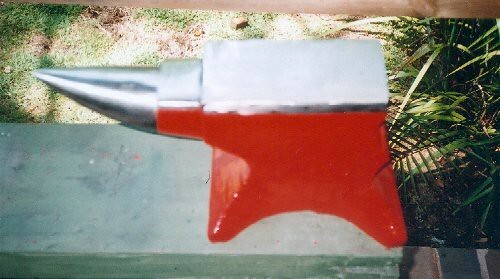 If you are ready to start blacksmithing now, or intend to do blacksmithing as a paying profession, buy a new anvil. Making an anvil from scratch is not for the faint hearted. Two options are available, casting, and fabricating. A colleague recently became so frustrated at trying to find his "dream" anvil ( a 6 cwt London pattern anvil) he got a detailed quote from a reputable foundry. The cost, including heat treating and machining, but not pattern making was $AUD1800. If you know what you want, or want something unusual, and are good at pattern making, this may be for you. Another option (as yet uncosted by me) is getting a flame-cutter to cut an anvil out of 4, 5, 6 or even 8-inch plate for you. Several people have websites on this method, and again, it's a lot of work, especially the grinding and hard-facing. Be prepared to pay at least $AUD600 for a decent sized anvil. What anvil should you get then? It depends on what you want to do with it. If you are a jeweller, something small and highly polished. If you are a beginning blacksmith, I suggest 50 kg (110 lb) as an absolute minimum, but 90-110 kg (200-240 lb) if you intend to get at all serious about your hobby. If you must have a portable anvil, I suggest a 50, 60, or 70 kg (110, 132, or 154 lb) anvil – anything bigger is too hard to move. If you are a professional then my advice is irrelevant, but most that I have met have several anvils to suit different purposes. My overall advice is to get the largest anvil you have space for, and can afford. I've even seen a medical instrument maker working on a large anvil - in his case the horn was dressed to a needle point for fine work, and the face polished like a mirror. Anvilfire.com - a comprehensive source of blacksmithing information. Blacksmiths Journal - fantastic articles! Vaughns Ltd. - English and expensive! Contributions to the cost of this website, whilst not sought are always gratefully received.